Any well-drained soil. Drought tolerant. Naturalizing. mixed beds. cut flowers. Excellent butterfly plant. Easy. Forms good clumps but not invasive. May self sow. Divide at 4 to 5 years. Long blooming. strong color. This is an extremely popular plant that is loved for its large, bright pink, daisy-like flowers that last from midsummer right up until frost. This native species is a bold plant that will reach heights of 3 to 4 feet. It does well in the back of the border and is also a good choice for wild-flower gardens or naturalizing. Coneflowers make good cut flowers and will last for several days in a bouquet. The seed heads (center of the flower) also dry well if cut before seeds develop and make an interesting addition to dried arrangements. 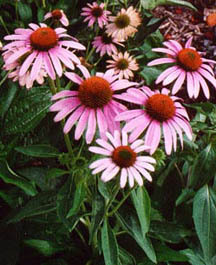 Coneflowers are quite undemanding, have few insect or disease problems, and are drought tolerant. Avoid soggy soils. Flowering is best in full sun though they will be okay in light shade. They should be divided every 4 to 5 years to maintain vigor. Discard woody portions when dividing. Coneflowers will also self sow quite readily. Space plants 18 to 24 inches apart.